Arsenio Martínez de Campos in his later years. Arsenio Martínez-Campos y Antón, born Martínez y Campos (Segovia, Spain, December 14, 1831 – Zarauz, Spain, September 23, 1900), was a Spanish officer, who rose against the First Spanish Republic in a military revolution in 1874 and restored Spain's Bourbon dynasty. Later he became Captain-General of Cuba. As soldier and politician, he took part in the wars in Africa, Mexico, Cuba and the last Carlist war. 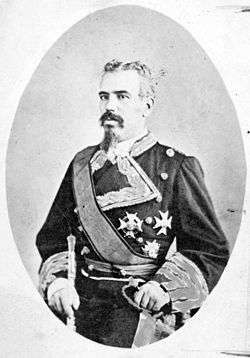 Martínez Campos received a military education and after 1852 served on Spain's general staff (Estado Mayor). Later on, he was named professor in its academy. In 1860, he was sent to Africa, and also took part in the Mexican 1861 campaign against urban rebels under General Juan Prim, in a joint expedition along with France and Britain. After the Revolution of 1868, Arsenio Martínez Campos requested posting to Cuba, where he fought well against the rebels in 1869 in the Ten Years' War, gaining the rank of Brigadier General. Success in this war commonly was a matter of perception, the Spanish Army after taking serious losses, would take the field in bayonet charges thus technically winning. However, the Cuban rebels would count up the Spanish losses against their own and consider the action a victory in terms of body count and withdraw. The Cubans also knew that movements of Spanish in the field caused the exposure of the susceptible Spanish forces to yellow fever and other tropical diseases; these diseases would hurt the enemy further. Martínez Campos, perceived as too soft to win, was displaced by the ruthless Blas Villate, Count of Balmaceda ; who proceeded with a brutal campaign of ethnic cleansing called, "The Rising Flood of Valmaseda". In 1872, Martínez Campos returned to Spain, where he backed the coup d'état led by Manuel Pavía. Here, he took charge of several brigades to fight the Carlist uprisings with little success. After this, he was put in charge of the Valencian army, fighting Independent forces in Alicante and Cartagena. The chaotic situation in Spain caused him to plot against the Republic and in favour of Alfonso XII, son of the exiled Isabel II. On the 29 December 1874, Martínez Campos led a coup d'état in Sagunto to restore the throne to Alfonso XII. Later, he was named Captain General of Catalonia after defeating the Carlists there and in Navarre in the Restoration. He was made Captain General (governor) of Cuba in 1876 where his reputation as a noble warrior allowed him to arrange a peace treaty (Paz de Zanjón) with the war weary Cuban rebels in 1878. This treaty granted more autonomy to Cuba, freedom to rebels who had been slaves, and a few years after led to the complete abolition of slavery on the island. Returning to Spain, and after presiding over a conservative government in 1879 as Cánovas's puppet, he was forced to leave the Conservative Party, since he favoured granting total freedom to all races in Spain. He turned to the Liberals. As Minister for War under Sagasta, he founded the Academia Militar General. Monument to Martínez-Campos in Madrid (M. Benlliure, 1907). In 1893, he was named general-in-chief of the African army, and subscribed a peace treaty (Peace of Melilla) with the Sultan of Morocco in 1894. That same year (1893), he suffered an assassination attempt. Two years later, he returned to Cuba, but facing an incorrectly perceived need to toughen measures against the rebels, he refused to order ethnic cleansing and resigned his post. He was replaced with by Valeriano Weyler. Martínez Campo returned to Spain, where he was named president of the Supreme War and Navy Council until his death in 1900. Weyler’s tactics did not lead to victory but instead contributed to the U.S. intervention in the Spanish–American War. 1 2 "Arsenio Martínez Campos". The Columbia Encyclopedia, Sixth Edition. Columbia University Press. 2007. Wikisource has the text of a 1911 Encyclopædia Britannica article about Arsenio Martinez de Campos.